Research at a university is conducted by a teaching staff, also an independent researcher, who sets a theme by taking account of society's needs, wishes and trends and, while allowing his/her imagination free reign, forms a team with other faculty members from inside and outside the school on an as-needed basis. Faculty of Engineering puts emphasis on selecting, while still in buds, application research that are needed by society, and basic research that would contribute to the advancement of science so both can grow with university-wide support. In 2010, decision was made to close the Graduate School of Engineering, Department of Civil Engineering and Architecture reflecting the university reorganization that was taking place in early 2011, where teaching staff of architecture and civil engineering-based subjects in Faculty of Engineering were being merged with those of the Graduate School of Urban Innovation and Faculty of Urban Innovation. Going forward, their activities will continue in the latter two, which are graduate organizations that integrate liberal arts and science. Another change is that together with this reorganization all "Departments" subsumed under the three "Divisions" of Faculty of Engineering will be eliminated in order to further promote integration of research efforts. We are now in the third year of the GCOE (Global Center of Excellence) program, "Innovative Integration between Medicine and Engineering Based on Information Communication Technology" (COE Leader: Professor Ryuji Kohno), which was adopted in 2008. The educational and research activities on medical ICT that are being carried out jointly with Yokohama City University, National Institute of Information and Communications Technology, and Oulu University of Finland have grown considerably, as we have entered the second half of the five-year program. 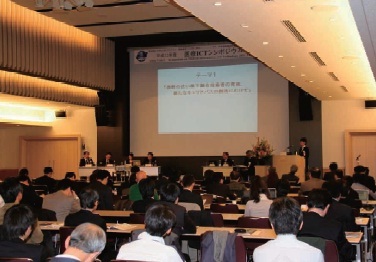 Activity updates can be found in GCOE's web page (http://gcoe.mict.ynu.ac.jp/en/). In order to nurture the sprouts of research that shall bloom into large-scale projects in the next generation, the Faculty of Engineering is conducting a five-year "Interdisciplinary Projects Research" program, which is internal to the Faculty of Engineering. Four themes were pursued during the first five-year phase starting in academic year 2002, which took over the 21st Century COE, and from the Interdisciplinary Projects Research was born the GCOE described above. At present the second phase of the Research is ongoing from AY 2007 with six themes, in 2009 their interim evaluations took place, with 2011 being the final year. One of these projects, "Hydrogen Energy to Support Sustainable Society Yokohama Project," became the basis for establishment of the Green Hydrogen Research Center, a Faculty of Engineering facility, in 2011. As a precursor to next-generation Interdisciplinary Projects Research, small- to medium-scale cooperative research projects known as "Group Research" are underway, which can be started with just a few teaching staff of Faculty of Engineering. Already the first phase from AY2007-AY2009 is completed, with the second phase from FY2009-FY2011 in progress. We started calling for applications from the end of 2010 for the third phase of Group Research from AY2011-AY2013 and have sixteen applications selected that are awaiting official announcement. Furthermore, there are also plans in phase three to provide support for seminars, etc., with invited speakers/lecturers from outside the university. In order to stimulate these kinds of faculty research activities, Faculty of Engineering ran a trial of "Self-Improvement Program" for the teaching staff in AY2009, which was implemented in 2010. In AY 2010, two staff that made use of this program spent an extended period abroad, coming back refreshed. We have great expectations from them in the future. As AY2010 was coming to a close, on March 11, 2011, the great Tohoku Earth Quake occurred. May those who lost their lives rest peacefully, and those victims displaced by the disaster recover as quickly as possible. In order to recover from this disaster, the Japanese economy and society as a whole will likely have to endure a great deal of hardships for a long period of time. None other than the progress of science and technology can overcome such a calamitous situation. It is in this conviction that I say we need to forge ahead full-bore with our research projects.